The picture shown above is of the Serena single electric adjustable bed. You will notice that the head end is slightly raised at the upper end portion of the bed. 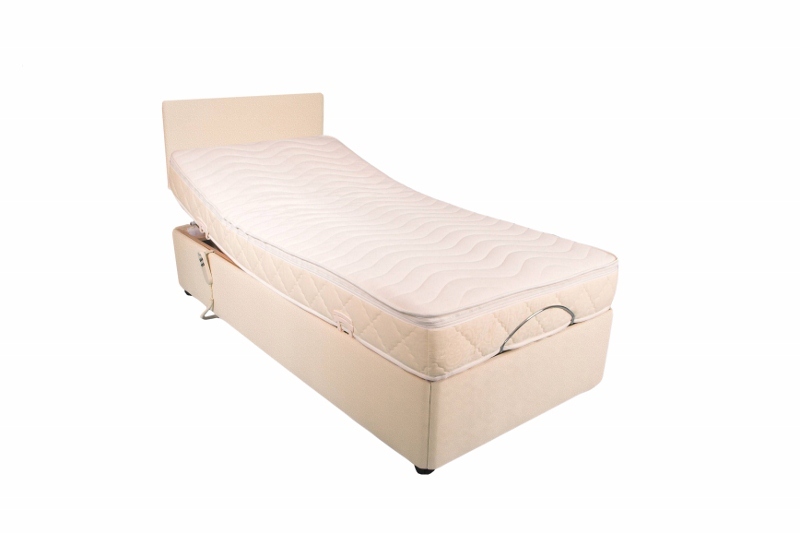 This electric bed is 3’ wide and 6`6” in length and upholstered in high quality Ivory suedette material. As of now, we have variety of four different colours that you can select however , if you suggest a colour you would like your bed base, as well as what material to use, we can manufacture to suit your requirement. An additional charge may apply depending on our customer’s demand. Without hesitation, simply ask one of our consultants to discuss your requirements on our free phone number. The ivory material goes well with lighter shades of carpet either as a match or contrast. The base of the adjustable bed is available with a beautifully made dovetailed drawer in the foot end. The bed shown in this picture does not have a drawer, however when the foot end of the profiling bed is raised there is space to store belongings. In our factory shop we use the storage under the adjustable beds to store our range of memory foam pillows. The head end offers a huge space for storage because of the way that the electric mechanism raises in a straight line pivoting from the lower back position. In fact a lot of our customers will put storage boxes inside the bed base. The foot end of the bed mechanism lifts differently because it breaks at the knee in order for the lower leg section to remain just a few degrees less than horizontal. This makes it a tighter squeeze to get your junk under the bed. Another nice feature of the bed base is that it has twin castors which make it easy to move the bed in the room. Each or the four castors have a brake so that the bed can be locked in position. One of our comfortable mattresses used on this adjustable bed shown above is the pocket sprung mattress. The design allows the spring to work independently to contour to your body shape which is important in order to get a good night’s sleep. The photograph above has an option 2 headboard at only £70. When you visit Build a bed in our website http://www.bed-adjustable.co.uk/build-a-bed/ you can see images of eight different styles of headboards that you can select from to design your adjustable bed at very affordable prices. Lastly, you can have spare washable covers from only (£79) to accessorize your chosen adjustable bed. This Serena single adjustable bed with spare washable cover and pocket sprung mattress is only £649 excluding vat. There will be no charge if you collect the bed from High and Dry Manufacturing Ltd in Chichester, West Sussex. This entry was posted on Thursday, October 13th, 2011 at 9:45 pm	and is filed under Adjustable Beds Trade Pages. You can follow any responses to this entry through the RSS 2.0 feed. You can leave a response, or trackback from your own site.